WDW Resort, Florida Delivery Service Available! ALL APPAREL AND SETS: 2 WEEKS (10 Business Days) TO SHIP. 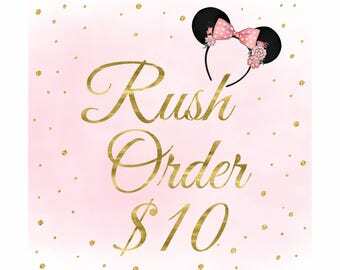 MINNIE EARS & HAIR ACCESSORIES ONLY: 3-5 Business Days TO SHIP. RUSH ORDERS: Please contact us as we welcome rush orders if we are able to fulfill by your need by date. Item is beautiful and fast shipping! This shirt is excellent quality and somehow even prettier than the photo shows. Communication and service far exceeded my expectations. I would give 10 stars if I could! Bringing you the finest in theme park apparel and accessories for the whole family! Designs by Ever After makes unique and one-of-a-kind boutique apparel and accessories for the whole family. We hope you enjoy our products as much as we have enjoyed designing and making them for you. Most of our items are custom made to order so they are not returnable unless there is an error or problem on our end. We take pride in our meticulous work and craftsmanship and know you will be pleased with your purchase. We accept payment through etsy! Most of our items are custom made to order so they are not returnable unless there is an error or problem on our end. We take pride in our meticulous work and craftsmanship and know you will be pleased with your purchase. Unless our item says "in stock" or "ready to ship", our items are custom made to order and to your specifications. Most items ship within 2-3 weeks of purchase unless there is a special custom request for fabric or types of blank garment that must be ordered from our vendors. If you have a rush request for a special occasion, just let us know and we will work to accommodate your request. We look forward to designing and making your beautiful boutique item. Have a great week!